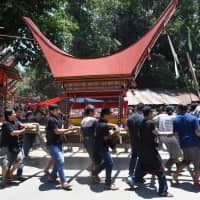 LA'BO, INDONESIA - Martha Kande’s family lived with her graying, shriveled corpse at their home in Indonesia for seven months as they prepared an elaborate funeral that is central to the Toraja people’s centuries-old death rituals. Torajans — an ethnic group that numbers a million people on Sulawesi island — have few qualms when it comes to talking with an embalmed corpse, dressing it up, brushing its hair or even taking pictures with it. Traditionally the embalming process involved sour vinegar and tea leaves, but these days families usually inject a formaldehyde solution into the corpse. “After a week, there’s no odor anymore,” said tourist guide Lisa Saba Palloan. 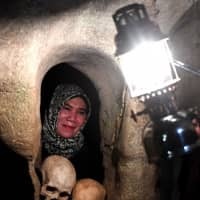 It may seem ghoulish to live side by side with an embalmed body for months — or even years — before paying homage in a ritualistic display of blood and guts. As Kande’s family prepared her mummified body for the afterlife, wild boars howled and blood poured from a sacrificial buffalo’s throat. 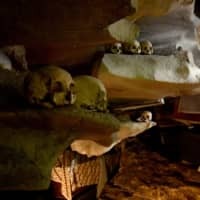 Following the five-day ceremony, the octogenarian was placed in one of the many burial caves scattered around the mountainous region, where skeletal remains are arranged by social hierarchy. They sit alongside wooden dolls in traditional clothing, representing deceased nobility. 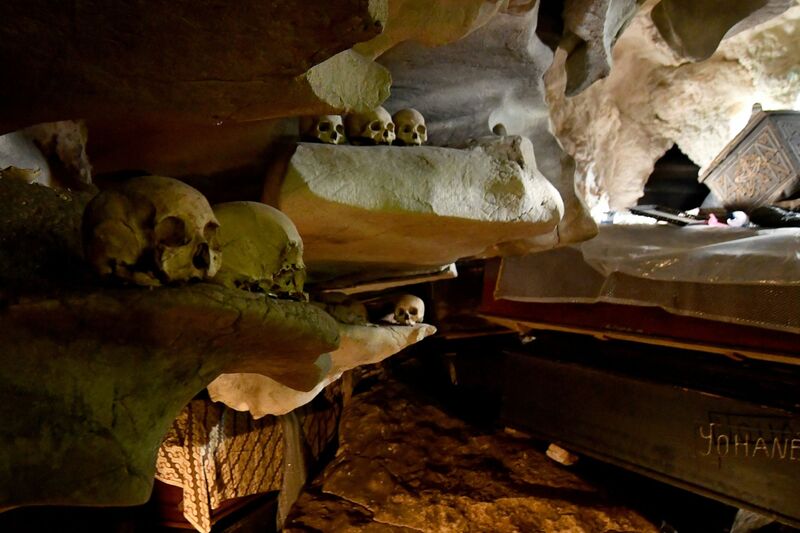 Some bodies are kept in coffins that hang from steep cliffs, owing to limited space. Although most Torajans are Christian — a product of Dutch colonialism — they have held on to earlier traditions rooted in animistic beliefs. The more elaborate a funeral, the more likely the person’s spirit will reach the level of the gods. But it comes at a cost. As many as 100 buffalo could be slaughtered for a noble person, though as few as eight will suffice for a middle-class Torajan. “We used to be animists, so we buried people with boars and buffaloes to offer the spirits on the way to the afterlife,” Singkali said. At midday, a prized buffalo was led out onto a blue tarpaulin where its throat was slit — confirming the woman’s death — and the carcass was butchered for a big dinner to follow. 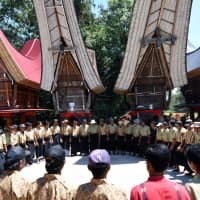 While the Toraja region draws tens of thousands of tourists annually, that is a fraction of the millions who descend on Bali. 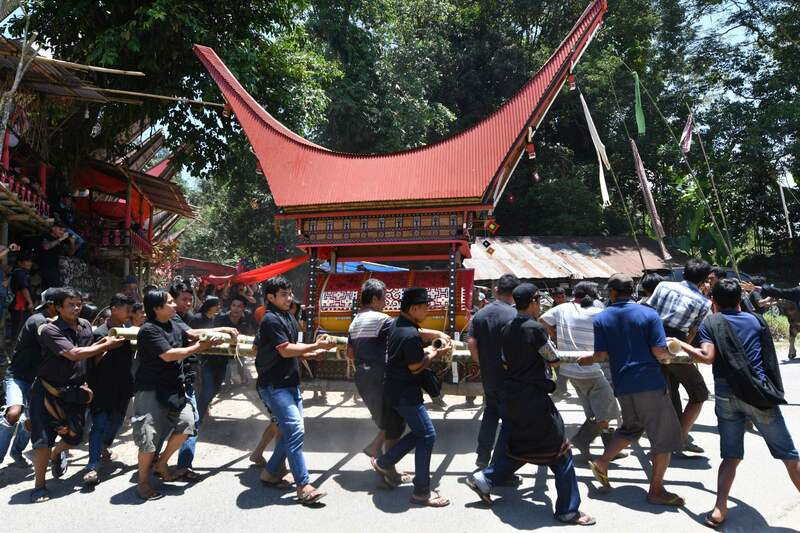 Increasing Toraja tourism faces several hurdles, although opposition from locals does not appear to be among them.